Proposed rezoning of a portion of 2403 51 Avenue NW to allow for limited commercial uses and industrial development. 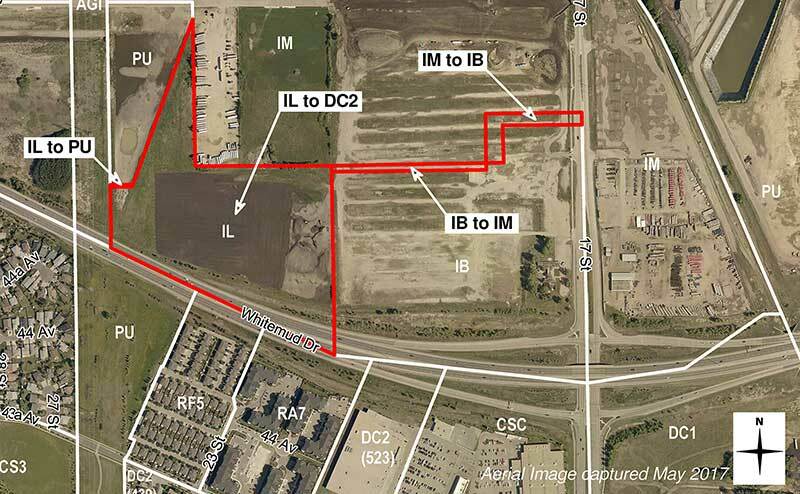 A planning application (map) has been received proposing to rezone a portion of 2403 51 Avenue NW from Light Industrial Zone (IL) to Site Specific Development Control Provision (DC2), which will allow for a limited range of commercial uses and industrial uses that would operate in a way that no nuisance factor is created or apparent outside an enclosed building. The proposed rezoning will also establish a 6-metre building setback from the pipeline right-of-way along the western boundary of the property. The application also includes an amendment to previously approved zoning. The amendment proposes rezoning part of the subject property from Light Industrial Zone (IL) to Public Utility Zone (PU) and the adjacent property, 4510 17 Street NW, from Medium Industrial Zone (IM) and Industrial Business Zone (IB) to Industrial Business Zone (IB) and Medium Industrial Zone (IM), to match with approved subdivisions. Plan to help support growing industrial land demand. For rezoning portion of 2403 51 Ave NW. Regulations, schedules, site specific development control provisions, and zoning map.